Not all LASIK surgeons are equal; selecting the right one for you will affect the quality of your vision results. Understanding the importance of experience, skill and technology is valuable as you evaluate your options. To assist your decision, Dr. Colby Stewart has provided easy-to-follow information to help you gain a better understanding of how LASIK works and what makes Stewart LASIK one of Houston’s premeir LASIK specialists. All you need is 5-10 minutes. After you become an 'expert', you may be ready to schedule your FREE, no-obligation LASIK consultation with Dr. Stewart online and secure. 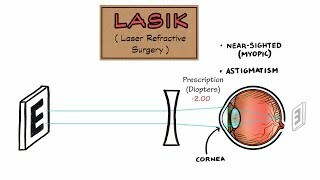 LASIK is an outpatient surgical procedure that uses high-accuracy pulses of light to reshape the surface of the cornea (the lens on the front of the eye). The ultimate goal of LASIK is to help patients enjoy the comfort and freedom of clear vision without the use of glasses or contacts. LASIK can correct most common eye conditions: nearsightedness, farsightedness and astigmatism – allowing a majority of patients to achieve 20/20 vision or better. Light focuses beyond the retina, making vision blurry. Light focuses before the retina, making vision blurry. Light focuses irregularly across the retina, making vision blurry. The corena is reshapen to allow light to focus on the surface of the retina, making vision sharp. i.e. no conditions such as cataracts, glaucoma, etc. Your eyes must be healthy. If you have any condition that will affect how your eyes respond to surgery or the healing process, you must wait until that condition has totally healed. Conditions, such as cataracts and glaucoma may disqualify you immediately. You must be an adult – 18 years or older to qualify. Has your prescription changed in the last year? You must have stable vision for at least one year. Many young adults experience changes in their prescriptions, and should wait until their eyes have “settled” into one prescription. If you are pregnant or nursing, certain hormonal changes will affect your eyes. Surgery should not be performed until your hormones have “normalized” after pregnancy. Do you have any degenerative or autoimmune diseases? Degenerative or autoimmune diseases are disqualifiers, too. If your body has any trouble healing, this will negatively affect the outcome of refractive surgery. The industry average cost of LASIK is varied. Advertised prices can range from $600 per eye to $3500 per eye. On the low end are 'bait-and-switch' gimmicks designed to lure patients into calling with the intention of up-selling to a higher priced option. On the high end are surgeons that price services as a premium for ‘celebrity’ status or to reassure patients they are paying for the 'best'. Stewart LASIK provides services at a cost that allows us to offer the industry’s best equipment and to spend the time necessary to ensure predictable results. To help those that want the best results possible but need financial assistance, we offer 2-year, interest-free financing for qualified applicants. Monthly payments are as low as $150 per month. During surgery, most patients only feel slight pressure while some patients even report not feeling a thing. Valium will help calm your nerves. Following LASIK surgery, many patients experience mild irritation for a several hours. Dr. Stewart’s skill combined with the quality of our advanced lasers help ensure a nearly painless experience and fast recovery time. Are there potential risks involved with LASIK? Dr. Stewart has a reputation for safety and predictable results that is among the best in his field. In fact, he has never produced an infection in over 20,000 LASIK procedures. Despite this stellar track record, you should understand that LASIK – like any surgery – has potential risks. Some of these risks can occur before, during and after surgery. While most complications can be corrected or treated, some issues can be more problematic. In less than .03% of the cases, a cornea flap complication can occur during surgical preparation. This could be a free cap, a torn cap or a button-hole in the cornea. These types of intraoperative complications are extremely rare, but on occasion, can happen. Usually, the surgery is cancelled, the cornea is allowed to heal for 3 to 6 months, and LASIK can be done at a later date. Postoperative infections are extremely rare but can occur. The use of antibiotic drops after surgery, greatly reduces the risk of infection. Other potential risks include severe dry eye syndrome, various visual issues (halos, glare, starburst, double vision and loss of sight) and the continued need for glasses or contact lenses after the surgery. The need for an enhancement is a possibility. The national average for patients requiring enhancements after surgery is about 8-10%. If you are extremely nearsighted, farsighted, or astigmatic, your chance for an enhancement is higher than the average patient. Farsighted patients have the tendency to regress more than nearsighted patients. Planning for this regression, Dr. Stewart uses 20 years of experience to carefully ‘overcorrect’ farsighted patients during surgery by 20%. This means that a farsighted patient will initially be nearsighted right after surgery. These patients' distance vision will continue to improve and perfect over a two to three week period. Vision results vary greatly depending on the skill and experience of your surgeon and the quality of their equipment. Over 94% of Dr. Stewart’s patients experience prescription results of 20/20 (‘perfect’ vision). Many patients even experience 20/15 (better than 20/20). Certain unique eye conditions may not be conducive to these results; however, these patients may be able to drive without glasses or may only need them for certain activities after LASIK. Dr. Colby Stewart is proud of a 20-year track record of producing vision correction results and post-surgical eye health that places him in an elite group of surgeons throughout the nation. This easy-to-follow illustrated video discusses the causes of blurry vision, how LASIK corrects most vision issues, and a step-by-step walk through of what to expect from your LASIK experience with Dr. Stewart. Dr. Colby Stewart has always invested in the industry's finest LASIK technology for his patients. Dr. Stewart's commitment to find ways to provide better results drives him to constantly compare the latest refractive surgery technology on the market. This search recently led him to invest in the industry's most significant technology breakthrough in more than a decade: the Alcon Wavelight® Refractive Workstation. The Wavelight's revolutionary approach to laser eye surgery technology minimizes problems associated with older generation lasers, such as night vision reduction, glare, and halos. Dr. Stewart is excited to announce our recent investment of this amazing technolgy. As the first LASIK center in the area to invest in this technolgy, we hope you are as excited about this advance in technology and the results it will produce for you. The Allegretto Wave Eye-Q takes the proven Allegretto Wave technology to the next level of laser vision correction. The Allegretto Wave Eye-Q Laser System is designed to work in tandem with a wide range of surgical and diagnostic tools from the WaveLight line of products to provide superior safety and reliability. The WaveLight’s Wavefront Optimized approach uses state-of-the-art technology, Wavefront Optimized ablation profiles, that are only utilized by Allegretto Wave lasers to produce superior results. Spherical aberrations are reduced or are prevented all together with the Wavefront Optimized ablation resulting in better night vision and reduced sensitivity to glare. Human corneas naturally have an aspheric shape so that all light rays meet at a focal point. The Allegretto Wave laser performs an ablation with the goal of maintaining a natural postoperative corneal shape, and preserving corneal asphericity. Every treatment is customized to the patient’s individual refraction and corneal curvature. Using the Allegretto Wave Eye-Q 400 Hz Laser with Custom Wavefront Optimized technology a “map” is created of your eyes with their specific contours and unique characteristics to help with creating your personal vision profile. This map will also help locate and guide the eye’s exact treatment position, one of the most important factors in achieving a more naturally shaped cornea and excellent refractive outcome. The PerfectPulse System is comprised of three parts to optimise overall outcomes: Active Fast-Track Eye Tracker, gaussian beam laser, and high pulse frequency. The video-based tracker can follow even the fastest eye movements and adjust in less than 6ms, re-aligning more than 400 times a second. It tracks movements in the pupil within 1.8mm to 8mm and then automatically centers to ensure perfectly aligned ablations. A closed-loop tracking system reconfirms the eye’s alignment again before each pulse is placed on the cornea so that every pulse goes to the desired location. Three infrared light sources are used to monitor the patient’s eye. If the eye moves too far the tracker turns the laser off until it becomes re-centered before the laser picks up where it left off. As opposed to flat top beam lasers that leave a rough, notched surface on the cornea, the gaussian beam is an ultra fine laser with a beam size of only 0.95mm and a WaveFront to smoothly reshape the cornea with a curved smooth profile. By maintaining the eye's natural shape night-vision disturbances, glare, and halos are dramatically reduced or eliminated. By operating at high speed of 400 pulses per second with short bursts and combining with an ultra-thin beam the Allegretto Wave Eye-Q can sculpt corneal surface with the utmost precision. The Allegretto Wave Eye-Q 400Hz is up to 100 times faster than other lasers leading to much shorter procedure times and optimal post surgery results. Stromal dehydration is a condition during laser eye surgery after the superficial flap has been created and opened and the water between the collagen fibers in the cornea begin to evaporate from the exposed tissue. As the stroma becomes relatively dehydrated it gains a greater collagen fiber density so each laser pulse removes slightly more collagen tissue per pulse than it would if it was fully hydrated. Although the effects are minor final results may become affected. The faster the surgery, the less stromal dehydration takes place, the better the results, and the Allegretto Wave Eye-Q 400Hz is one of the worlds fastest with a speed of only 1.4 seconds per diopter. Overall, the final outcome with the WaveLight FS200 Femtosecond Laser and the WaveLight Eye-Q 400Hz Excimer Laser result in a reduced risk of post-LASIK complications and superior results. The possibility may also exist for custom LASIK to treat people who have previously lost best-corrected vision from any past refractive surgery. Unlike many large-scale, volume-based LASIK production clinics, Stewart LASIK provides personal care throughout your experience. Dr. Stewart personally oversees your vision correction from your initial consultation to your surgical treatment and your post-operative evaluations – ensuring you receive the best treatment and vision results possible. Now that you know a little more, the next step is to meet Dr. Stewart and find out if you are a good candidate for LASIK. Since your consultation is free, you have nothing to lose. Scheduling online is easy and only takes 3 minutes. During your consultation, we will determine if you are a candidate for LASIK, discuss your treatment and payment options and schedule your surgery. Once your big day arrives, LASIK involves a little valium, a 20-minute outpatient procedure and 1 day of rest. With immediate vision improvement, you may return to work the next day and resume most other activities within a few days! To keep your eyes healthy and your vision sharp, we schedule day-after, 1-month and 1-year followup visits.